Are you looking for an affordable, hand-crank coffee grinder? 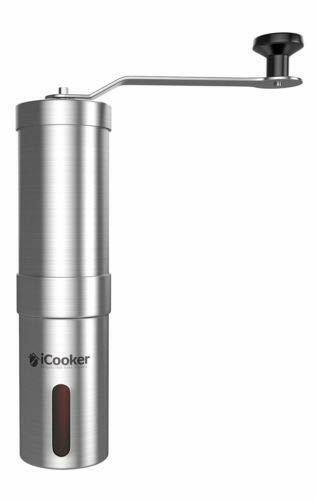 Then this one from iCooker should be at the top of your list. Read our buying guide packed with information to help you decide if it’s the right coffee grinder for you. The iCooker Coffee Grinder is for individuals who still prefer the manual operation. Purely manual operated, this kitchen gadget is portable too that you can easily bring it anytime, anywhere you need it. This is so ideal when you’re planning a weekend getaway with your loved ones at a hotel. Surely, the hotel has its own coffee maker and ground coffee beans. But, certainly too, you want freshly ground coffee beans. Since it is portable, the iCooker Coffee Grinder is so easy to put inside the luggage. It is lightweight so it’s like not having equipment inside your bag at all. And though it is manually operated, this coffee grinder grinds fasts because, as we said, it is lightweight and easy to handle. The hand crank is comfortable to use and won’t leave you feeling fatigued. You’ll find this an ideal gift for a special person who loves brewing coffee at home. The dark color of this kitchen item matches your kitchen well, no matter what theme or motif you have. This is especially true if your friend or family member buys pre-ground coffee. Just get them this grinder, along with a package of beans and they’ll notice a huge difference! If you want to guarantee freshness of your coffee, be sure to grind your own beans. You should therefore, invest in a high quality coffee grinder like the iCooker Coffee Grinder. What makes this coffee gadget different from the others is that it is portable so you can grind coffee beans anytime, anywhere you go. It may be manually operated but it produces the same excellent coffee grounds that the electric coffee grinders make. The best thing about it is the reasonable price. All you need to have this handy machine to have some delicious coffee every morning. Grind coffee beans wherever you want with a gadget you can bring and carry around conveniently. What do you think about this coffee grinder? Leave a comment below and let us know what you think. Also be sure to give this article a share on Facebook, Twitter, or Pinterest.